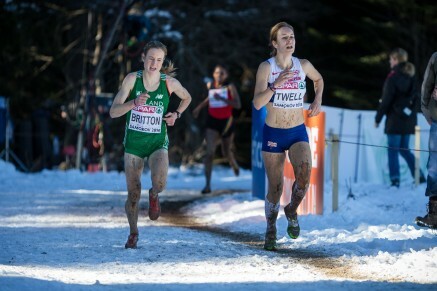 14th December 2014 – At the European Cross-Country Championships in Samokov, Bulgaria, Steph Twell had the honour of captaining the British Team and led them to the top of the medal table. Incredibly at just 25 years of age this was Steph’s ninth appearance at these championships and she used all her experience to mentor and inspire the British team as well as give a strong performance of her own. On an undulating and twisty course that was frozen and rutty for the early junior races, it thawed throughout the day and by the time of the senior races was muddy underfoot. Steph ran with the lead group until the final 2 laps but had to concede ground as teammates Gemma Steele and Kate Avery pushed the pace. As always though Steph gave everything she had right through to the line and was delighted with her seventh place finish at the end. She was also the third counter for a victorious British squad. In the Senior Mens event Tom Lancashire continues to show that he is coming back to his best and despite conditions that he probably wouldn’t have chosen he acquitted himself well and finished strongly to take 27th place.